New Delhi: The SHRM India Annual Conference & Exposition 2017, the biggest event for HR fraternity of the sub-continent, gets underway at the Taj Palace Hotel in New Delhi today. The event will engage human resource professionals around the theme ‘WIN’. In this two day event spread across 25+ knowledge sessions, eminent HR practitioners gathering from all parts of the globe will discuss the traits required for winning – FIRE, COLLABORATE, EVOLVE, FIRST MOVER, and BELIEF. These two days are also ideal for networking among industry peers and colleagues. Ms. Achal Khanna, CEO, SHRM India set the ball rolling on the first day of the conference by welcoming all the delegates and speakers. Apt to the theme – WIN – of the event, the keynote address was delivered by Mr. Rajesh Sud Exe. Vice chairman and MD – Max Life Insurance. In the session titled: What does it take to make promote winning as second nature in your organization? Mr. Sud explained how one can make bold and transformational leadership commitments to move towards a future that redefines and restores relationship with collaborative winning! The session was followed by a special address by Dr. Brad Shuck, Associate Professor of Organizational Leadership and learning at the University of Louisville and Strategic & Academic Partner, BI WORLDWIDE, on the importance of an employee value proposition to build workplace conditions that promote happier, committed employees at all levels i.e. winning employee. Following series of concurrent knowledge sessions also got underway on the day one of the event. · How can Indian companies tide the wave of automation & prepare themselves for jobs of tomorrow? In a special session on – Dramatic Conversations, Abhijit Bhaduri one of India’s most noted columnist and Ashish Vidyarthi, National award winning actor engaged the audience with a meaningful deliberation on truth and its many shades and the ups and downs face by a person in his life and careers. CEO Speak-Creating a winning organization, had CEOs from some of the most influential organizations and institutions across sectors who deliberated on the most useful practices, policies and processes which assure vitality and adaptation of an organization in difficult times. The speakers also shared a few tips and tricks on overcoming workplace hurdles and winning. 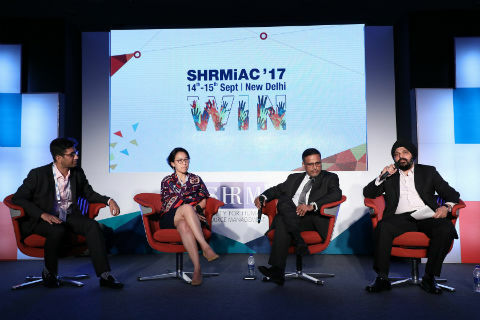 Talking about sixth edition of the conference, Ms. Achal Khanna CEO, SHRM said, “This is the biggest HR platform in this part of the world and helps participants stay abreast with the latest driving forces of the industry. It also brings together top thought leaders from across the globe who share key insights, best practices and tools to build a winning organization. True to its theme, day one of the conference has delivered thoughtful insights into building a winning culture and equipped participants with the necessary knowledge and tools to make that a reality. The remaining part of the conference will also be equally insightful and rewarding for all participants”. In his closing keynote, Padma Shri awardee Mr. Ajeet Bajaj, (also an adventurer, explorer and the first Indian to have skied to both ends of planet Earth) talked about the leadership and life lessons he has learnt along the way on his arduous and amazing adventures! The day concluded on a winning note with the HR Excellence Awards ceremony followed by a Gala Evening. Opening act by Tatva dance Troupe, from Amity University; Performances by ‘HR’s Got Talent’ finalists & laugh riot with Stand-Up Comedian Vikramjit Singh were to help soak in the days learning’s and rejuvenate for second day of the conference. The awards handed out in nine different categories which recognize organizations for their pioneering and innovative people management practices that impact not just organizations but also business, society and the profession as a whole.